Discovering your Heal’r within is about looking at a picture that is out of balance and understanding how to brighten the blurry bits, clean the smudges, realign the frame, then step back to see your achievements and how far you’ve come. Discovery is not about perfection, it’s about things we learn along the way. The things that change us which ultimately unearths self empowerment, freedom and healing. Our Certified Organic Turmeric, Cacao, Reishi blends are the first of their kind in the Australian cafe and health scenes. From decades of clinical nutritional practise and cooking classes, our Heal’rs heard what consumers and clients were looking for. They were seeking reputable and trustworthy brands who were invested in quality. They wanted reassurance of what they were consuming and how they were exercising, was effective and safe for their family and selves. 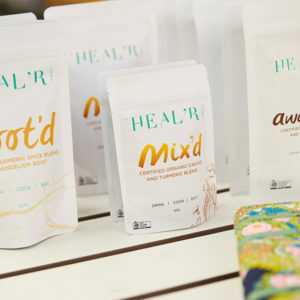 Heal’r @healr_within, in Carnegie Melbourne, is the first truly integrated specialised movement studio with clinic and apothecary ever created world wide. Heal’r has more than just a beautiful spa menu or class timetable designed to make you feel good on the outside. Our Heal’rs are trained to help you discover how to glow from the inside. Professionally qualified and expertly trained, our Heal’r company are genuine people who you can relate to. Collectively we have worked in small private clinics to big gyms. We have seen the need for a company who is invested in their clients and members. 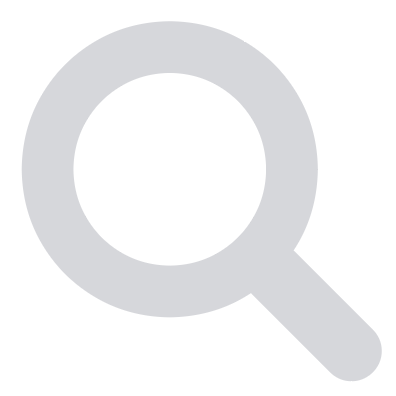 A company who is invested in helping give guidance beyond the quick fix, (which we all know deep down does not work, but are tempted to jump to, again and again). We have created a Heal’r home where you can feel accepted no matter what your experience or story. For those who want online support, we’ve launched the first of its kind, Heal’r Your Gut programme and soon Heal’r Your Immune. The convenience to manage your life anywhere you go, is something we all need in this forever changing world. If you are looking for real, long term results, we are here to help discover your Heal’r Within. 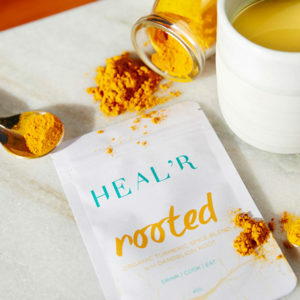 Rooted by Heal’r, is the first Organic Turmeric Spice Blend with Dandelion Root. 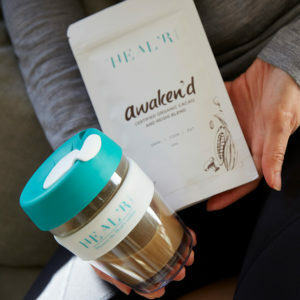 Awaken’d by Heal’r is a luscious, decadent taste sensation. Nourish your Heal’r within. Mix’d by Heal’r is a unique creation of our Heal’r Turmeric blend mix’d together with Cacao and Reishi. Deliciousness right there!